IMAGE: An example of existing filtered permeability in Rathmines. — Measures would remove through traffic on residential streets. — ‘Quietway’ or ‘neighborhood greenway’ already faces opposition. A public meeting to discuss a proposed Terenure to Ballsbridge walking and cycling route is to take place this evening (Tuesday) at 7.30pm in the Three Patrons Church Parish Hall on the Rathgar Road, Dublin. Cllr Paddy Smyth (Fine Gael), who originally proposed the idea, is hosting the meeting for the route which is proposed to be a type of route known in other countries as a ‘quietway’ or ‘neighborhood greenway’. 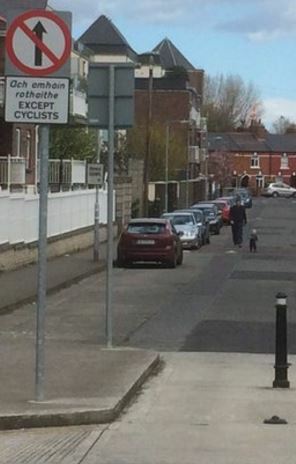 IMAGE: A toddler with an adult walking on the road behind filtered permeability in Ringsend. According to Cllr Smyth the idea is to link up a succession of vehicular cul de sacs, which will ensure that children and others will be free to walk and cycle without having to compete with commuters, buses and trucks. He outlines how the advantage for residents is that the plan would reduce the use of residential streets being used as rat runs by car commuters. Last year, consultants for Dublin City Council wrote a Quietway Feasibility Report (PDF) and looked at possable routes for such a quietway. The report recommended a number of possable interventions — including bollards to stop rat-running motorists and allow for filtered permeability, raised crossing over side streets, and new crossing where the route meets busy roads. The concept usually includes few or only short sections of cycle lanes or cycle paths and in the draft options presented by the consultants only has cycle paths proposed for the main road in Herbert Park. The report estimated the route would cost approximately €324,384 to implement. Opposition to the route is already mounting. A proposal to make a gap in the wall between Corrib Road and Ashdale Gardens to allow for filtered permeability for people walking and cycling was strongly opposed Ashdale Gardens residents. Because of this, the route will now likely start in Terenure and not the neighbouring area of Kimmage, as originally envisaged. The last article we published on the planned route includes a long comment section, including comments added in recent days ahead of the meeting which imply that the quietway would be a “speedway” leading to the “ruination of these suburbs” — according to those who have worked on similar projects in London and elsewhere, when filtered permeability is put in place similar vocal opposition is usually overshadowed by general acceptance by most residents who see the benefits of cutting rat running. Filtered permeability has become common on routes in the UK, while in the Netherlands it is even more common place and seen as a way of calming large neighbourhood blocks, while also promoting use of walking and cycling. Health experts, such as those at Public Health England, support filtered permeability measures for both promoting active travel and for allowing more possibilities for children to play or be active on their streets. It’s a pity the Ashdale residents don’t want to be connected through to Corrib Road; there’s a whole local stymie where people can’t cross from one estate to another in that area – another is at the spur of Shanid Road, which would make a natural crossing via an old lane into Cedar Court, which would allow the children from Scoil Mológa, the local Gaelscoil, and Harold’s Cross National School, next door to it, to join this quietway – it would hugely increase the numbers cycling to school there, and obviate the necessity for them to be dropped to school by car. Has Cllr. Smyth abandoned the Corrib Rd/Ashdale Gardens proposal? I think there was a lot of misinformation around this project e.g. cycle way/cycle lane. Creating permeability between Corrib Rd/Ashdale Gardens will: enhance the quietway; provide safer movement of school children using sustainable modes and; save up to 5 minutes on journey time. Residents in Ashdale Gardens will benefit also e.g. ease of access to services in Kimmage etc. @Ally yes, he has indicated that he will not be proposing the route to use that section because of the strength of the opposition. Typical Irish petty snobbery. Ashdale Gardens residents are denying others safer and more pleasant access via foot and bicycle to and from their homes and places of work, school, business. Quite simply Ashdale Gardens residents consider themselves better people than those who live in former council house, Corrib Road. Let’s not pretend it’s anything else. Shame on those who objected. I would not tolerate this selfish mean spirited attitude in my own neighbours. The greater public good needs to win out here. It won’t necessarily make less traffic and more kids cycling to school, you will always have a number of kids who cannot cycle or parents who have to drive. How about figuring out acway to make it more accessible for drivers and lessen travel time rather than making traffic conditions worse? Or better yet put the money into more luas lines or and underground system once and for all. But, If you are going to bring in filtered permeability then make it accross the board in every estate. I dont understand why one road has it and another around the corner doesn’t when they are both used as rat runs? Regardless I will always opt for play/cycling with my child in the local park over a road any day of the week! Permeability, even for pedestrians, is no longer regarded as desirable by many living in modern estate areas and is only tolerated in older estates because alleys and shortcuts were built into the original design. At the interface of areas of differing social incomes, this is even more pronounced. It’s becoming a real issue because it is happening at precisely the time that we need to be making non-motor transport more efficient and accessible. Long walkways are closed off due to “security concerns” and when that excuse won’t work it’s “anti-social behaviour”. No doubt this occasionally has some merit, but for the most part such concerns are imaginary. Two such entrances to our estate were closed off for the latter reason when in reality a few harmless teens would hang out there the odd time, with very occasional high-jinks, but it never amounted to anything remotely significant. Despite significant support to retain the entrances, the people living close by were adamant that they represented some kind of existential threat to their way of life. The reality I suspect is that they think they are better than the people on the other side. The result is 1.5km detour for kids attending the primary school on the other side of the fence. So of course most of them get driven, adding to the gridlock in the local area for several hours a day. Thankfully I cycle. I was at the meeting tonight, very entertaining, yummy mummies and the cycle flying squad were there, all about getting their kids to d4 schools. Sorry no match for the middle aged middle income who wanted to protect their parking. Paddy had the eco camera crew were there, but the crowd said no. Given his age and qualifications I hesitate to think that he has anything but a very high level of intelligence but I might suggest that he gets his hearing tested, he kept on speaking as if this ridiculous idea was a runner, NO paddy they said NO. That’s right, a vociferous group of middle-class people were horrified at the idea of letting poor people possibly cycle through their neighbourhood, affecting their sacred right to park their cars outside their houses. Why should a quietway run through some streets and not others? Well, um, that’s the way routes work! As for playing in the park with your child, fine, but if kids can’t cycle safely through the streets then they’ll live at a distance from their native city and will never really know it. By the age of 13, it should be possible for a kid to roam 70km in a day, if the roads were safe to do so – Slane and Clane and Kildare and the Dublin Mountains and the Wicklow Hills are all there for them, roaming groups of teenagers could be exploring their city and their county and surrounding counties and having fun. If they can only play with Mummy in the park, they’ll never know this pleasure. Hi Shay, I was at the meeting last night as well. I think it’s important to add an additional perspective, without the use of childish labeling. While there were certainly legitimate concerns raised (eg. the gentlemen from Palmerstown Gardens & Cowper), many of the views were driven by self-interest (eg. house depreciation, tenants have a longer way to go to access mews at the end of the garden – yes, very “middle income”) and nonsensical (eg. the roads will actually be more dangerous for young-cyclists). And yes, it was frustrating that there was misinformation with re: to the removal of parking spaces in certain areas – a completely understandable concern for those affected. Those that supported the idea proposed (the details are far away from being worked out) were largely treated with hostility and, at times, quite disgusting behaviour (e.g. the American lady whose right to have a view questioned and told “for your information, we live in a democracy here”). It was a shame that the time of the event worked against many who would have been a voice of support (ie. the parents of the children who will benefit from this quietway and who strongly support it). The route proposed isn’t perfect. It wasn’t supposed to be at this stage, but it’s my view that it should be discussed in a manner that is respectful to all residents. I arrived a few minutes before proceedings kicked off, and the tone and language being used was disheartening (“this is how you commit political suicide”, “we’re in for a lynching”). As much as some may think they live in their own little fiefdom, we’re all part of the same community. The same community where we will grow old together and raise our children together. I do hope the next all-residents meeting is more cordial and balanced. I hope Cllr Smyth will tell people in good time before the next meeting on the amended proposal. I only heard about this one the day before; I told other people but they already had plans. If we’d had a week or 10 days’ notice, people who actually cycle in the area, and who have kids in the local schools, would have attended. All of the councillors who attended spoke against the proposed quietway when they heard the loud objections of the group from one street; it is a pity that some Green councillors, for example, weren’t there to talk calmly about the real need to cut pollution, allow children exercise and independence and make suburbs permeable to cyclists. Thank you to those who attended the public meeting. If you made a contribution this will be fed back to the council engineers reviewing the feasibility report in due course. For those who did’t get notification or only heard about it too late, apologies. Getting 10,000 flyers out can take longer than you’d expect. I would just like to correct the record on one major point regarding parking which was brought up on numerous occasions during the meeting and was also contained in a flyer which was sent to residents prior to the meeting. I attempted clarify this at the time but don’t think I was too successful. I hope this clarifies this point. I really hope you’ll succeed with this in the end, Cllr Smyth. Well done on getting this far. Don’t just rely on flyers. Put the word out on Twitter, on Boards.ie (cycling, transport and regional forums), on Facebook, get on the radio to talk about it, put up notices in libraries, and in the local schools that would be served. Not getting the word out this time meant that only the people from one small area were there in great force, rather than people all along the route, and people who would cycle it. I’m sorry I missed this meeting, only just spotted this posting today. I cycle this route at the moment and would love to see it improved to make it accessible for vulnerable cyclists. Herbert Park is very hostile at the moment; terrible surface, speeding cars and really poor entry and exit points at each end. Very sad to read about the extent of the opposition for something which would benefit school children, village shoppers and new cyclists. We have a real problem in this city where children don’t cycle and consequently, many are unfit and overweight. Paddy, I would echo what Crois says about getting the message out these on Facebook, Twitter, and any way you can. I would certainly have gone to this meeting if I had heard in time. What’s the best way for us to voice our suppor at this stage?